This morning I tossed out this tweet inquiring about yard space in the greater Dallas/Ft. Worth area. In response, die-hard Packer fan, @Packnic, thought it would be a good idea to form a Packer Shanty Town. He dubbed his plan to put it into action "Operation SB:45 Shanty Town". You might not think that forming a shanty town is an undertaking that requires extensive planning. You would be wrong. Dead wrong....dead wrong like you got trampled by sauerkraut-starved Packer fans, driven mad with Super Bowl excitement. 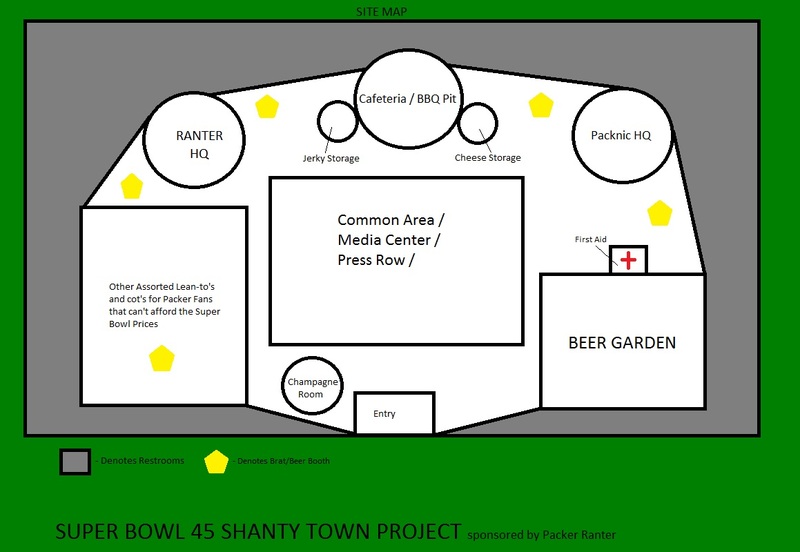 To create a successful shanty town, there needs to be a preparative stage to ensure that all shanty town residents are safe, secure, fed, and properly supplied with ample quantities of beer and jerky. @Packnic took it upon himself to KNOCK THIS PLANNING STAGE OUT OF THE PARK! Thank you, @Packnic, for your hard work! Oh won't you take me to - SHANTEETOWN! Oh won't you take me to - shanteeTOOOOOWNNNN. Thank you for your forethought. I would like to set up camp in your Lean-to area, in order to bask in the glow from the Beer Garden (as it is reflected off the shiny heads of media personnel hanging out in the Media Center/Press Row). I would also like additional information, if it is available, on how to gain access to your champagne room. Note, I do not plan to become beligerent, though I am not responsible for my behavior after 13 mimosas. 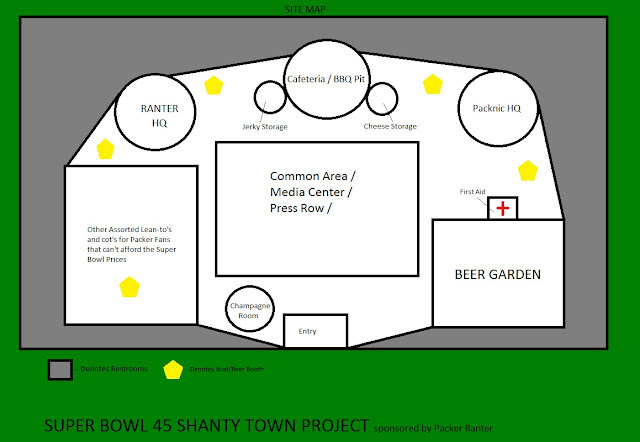 Shanty Town is a non-profit, for shizzle, but we do accept donations and/or detailed accounts of what transpired in the CR. As far as belligerent drunks go, I considered adding a "drunk tank" but figured it was redundant. The gratis access to Shanty Town is perfect in this economy. As always the Ranter (and associates) read and understand the pulse of the great Packer Nation. There is actually a place in WI called Shantytown. I should know, I'm from there. Google it.